We’ve got all the blueberries you need for the Fourth, your freezer, next winter, etc. Very easy picking – all varieties have ripe berries. We’re open Monday through Saturday this week – 7:00 a.m. to noon, with a special ALL DAY pick on July 3rd – 7:00 a.m. to 7:00 p.m.! And yes, we’re open on the 4th of July (7-noon). 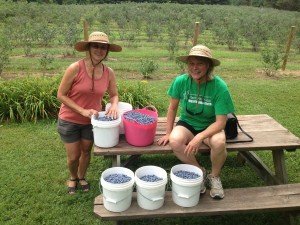 Elizabeth Bush and Mary Ann Hansen, goddesses of the Plant Pathology clinic at Virginia Tech, knocked out 65 pounds of berries in three hours. Wow. Thanks so much to all that came out last week! More than 1,200 pounds of blueberries left the farm on Friday and Saturday alone. We appreciate your business! ← Week of June 23 – Berries Berries Berries!!! !